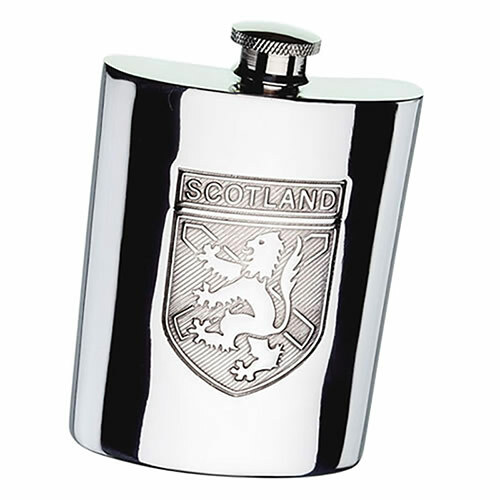 These high quality pewter flasks feature a Scottish design on the front that includes the name Scotland and an image of the lion rampant over the flag of St. Andrews. They have a capacity of 6 fl oz and have a traditional curved shape to sit comfortably on the hip. With the Scotland design on the front, these hip flasks are ideal as corporate gifts or luxury promotional merchandise for events or promotions with a Scottish theme. The highly polished body can be engraved and these flasks are offered with free text and logo engraving. We also offer bulk order discounts (see price matrix, below) and low fixed price UK delivery.